CAMBRIDGE, Mass. 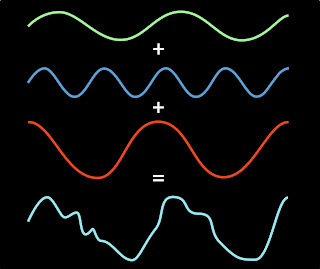 -- The Fourier transform is one of the most fundamental concepts in the information sciences. It’s a method for representing an irregular signal — like the voltage fluctuations in the wire that connects an MP3 player to a loudspeaker — as a combination of pure frequencies. It’s universal in signal processing, but it can also be used to compress image and audio files, solve differential equations, and price stock options, among other things. At the 2012 Association for Computing Machinery’s Symposium on Discrete Algorithms (SODA), a group of MIT researchers will present a new algorithm that, in a large range of practically important cases, improves on the fast Fourier transform. Under some circumstances, the improvement can be dramatic — a tenfold increase in speed. The new algorithm could be particularly useful for image compression, enabling, say, smart phones to wirelessly transmit large video files without draining their batteries or consuming their monthly bandwidth allotments. “Weighted” means that some of those frequencies count more towards the total than others. Indeed, many of the frequencies may have such low weights that they can be safely disregarded. That’s why the Fourier transform is useful for compression. An eight-by-eight block of pixels can be thought of us as a 64-sample signal, and thus as the sum of 64 different frequencies. But as the researchers point out in their new paper, empirical studies show that on average, 57 of those frequencies can be discarded with minimal loss of image quality. “In nature, most of the normal signals are sparse,” says Dina Katabi, one of the new algorithm’s developers. Consider, for instance, a recording of a piece of chamber music: The composite signal consists of only a few instruments each playing only one note at a time. A recording, on the other hand, of all possible instruments each playing all possible notes at once wouldn’t be sparse — but neither would it be a signal that anyone cares about. The new algorithm, which Katabi and Piotr Indyk, both professors in MIT’s Computer Science and Artificial Intelligence Laboratory (CSAIL), developed together with their students Eric Price and Haitham Hassanieh, relies on two key ideas. The first is to divide a signal into narrower slices of bandwidth, sized so that a slice will generally contain only one frequency with a heavy weight. Once they’ve isolated a slice of spectrum, however, the researchers still have to identify the most heavily weighted frequency in that slice. In the SODA paper, they do this by repeatedly cutting the slice of spectrum into smaller pieces and keeping only those in which most of the signal power is concentrated. But in an as-yet unpublished paper, they describe a much more efficient technique, which borrows a signal-processing strategy from 4G cellular networks. Frequencies are generally represented as up-and-down squiggles, but they can also be though of as oscillations; by sampling the same slice of bandwidth at different times, the researchers can determine where the dominant frequency is in its oscillatory cycle.